Friends and colleagues, distinguished guests. We are gathered again, the international rural sociology family, four years after Goyang, Korea, eight years after Trondheim, Norway and twelve years after Rio de Janeiro, Brazil. Four years is a short time in the history of the rural mankind, but a long time in the professional history of a scholar and also a long time in the history of the International Rural Sociology Association. Since we met last time, many of you have become Doctors and Professors. Some of you have obtained important posts, within and outside Academia and Universities. These personal advancements will improve the quality and status of rural sociology, and we congratulate you and welcome you as IRSA colleagues of high standing. Since we met last time, some of our colleagues have resigned or left rural sociology. Unfortunately some of our dear friends and distinguished colleagues have also acquired serious illnesses. Some of them we will never see again at the IRSA congresses. A few colleagues have also passed away, and we regret that with much sorrow. Other colleagues, as distinguished professors Bill Friedland, keep coming, and coming and coming, contributing a lot to the scientific community of rural sociology and sociology of agriculture. We are really standing on the shoulders of giants. Since we met last time, the world has seen a financial crisis not experienced since the early 1930s. Here in Europe we are now in the midst of second dip of a recession, and not least here we are in Portugal and the south of Europe, the future is vulnerable and insecure. Not least in the rural areas, the financial crisis have hit hard, because rural people all over the world have lower income and less wealth than urban people. Although the capacity to function as a buffer and withstand social, economic and environmental shocks may be better in rural societies, at least in some regions of the world. In the USA and elsewhere, climate change has hit hard with serious droughts as a consequence. Again we see food prices reaching the record high level of 2008. In our research efforts we should do more to explore how rural areas and modern rural societies could be socio-economic robust and climate resilient, in order to withstand economic and environmental shocks we have seen during the last years. We have in this year, 20 years after the United Nations Rio conference on sustainable development, experienced the Rio+20 conference. The outcome was regrettably only a voluntarily commitment, with nice words and now deeds. The Rio+20 Conference on Sustainable Development did not reach a global strategy on Green Growth and Climate Resilience. Still there are National Strategies and regional strategies, like that of the EU to slow Climate Change and enter the Low Carbon society. Rio +20 was not a big success. However, the world leaders should and must keep on trying. The alternative is too scary. Since we met last time, Barack Obama has been elected President of the United States, and he has acted for 3, 5 years. A long leap forward for the people of colour in the US and the world. Of his deeds I will not say much, just that some are disappointed, and some pleased. Among those pleased I guess those 30 some millions who have got their health insurance will be. I am also pleased, as a European and world citizen, that the United States are back into international fora, where they once were opting out. In my term as IRSA president, the council have had three meetings, one in Goyang, Korea, one in Gothenburg two years ago during the ISA congress there, and then yesterday when the outgoing council meeting was held. The council has worked to replace the President and Secretary/Treasurer, which was successfully done when Professor Geoffrey Lawrence, University of Queensland, Australia was elected to replace me as next President and Professor Raymond Jussaume; Michigan State University, the USA was elected to replace Dave Hansen as next Secretary/Treasurer. The executive committee which consists of vice Presidents Lynda Cheshire and Surichai Wungaeo, Secretary/Treasurer Dave Hansen and myself have worked hard to find candidates for the next congress, and we are happy to inform you that Toronto, Canada will be announced as venue for the 2016 IRSA congress later this week. Personally I have worked with our webmaster Kjartan Anthun to modernise our webpage and to introduce several new features there, among others the Presidents corner and Rural sociologists in media. IRSA is also on Facebook with 145 friends who like us; we need more of you there. 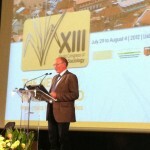 The thirteenth world congress of rural sociology seems already to be a memorable congress. 75 working group leaders have been preparing a comprehensive program with 1450 papers. The scientific committee and the local organizing committee have undertaken a major effort to facilitate a program that also includes a number of excursions to the countryside of Portugal. This congress will be one with the largest turnout ever, with more than 1000 participants recorded so far. On behalf of IRSA, I will congratulate Professor Manuel Moreira and his team with an excellent preparation for this congress and we are looking forward to an exciting week. 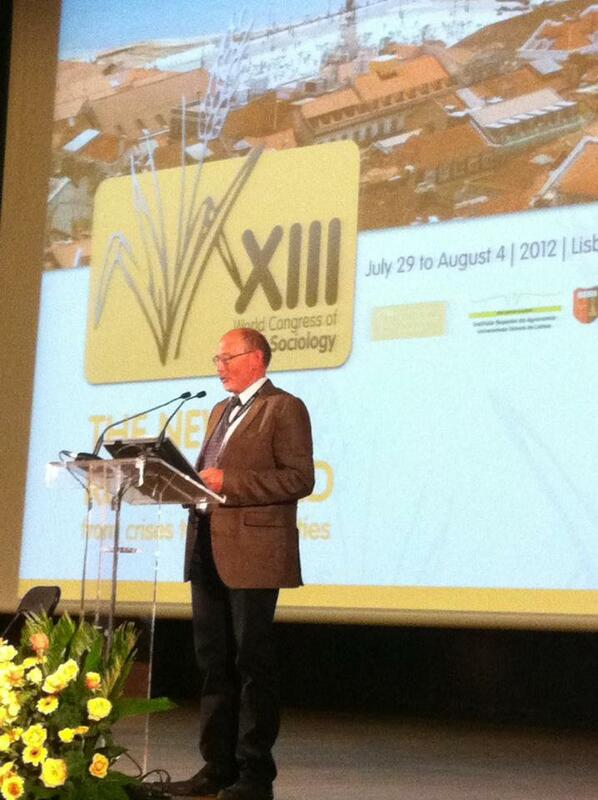 I herewith declare the XIII World Congress of Rural Sociology opened. This entry was posted in About IRSA, Other news on July 29, 2012 by admin.